What Is the French Dining Experience? Before you begin working your way to foreign language fluency, it helps to understand the culture behind the language you’re learning. After all, language exists to help a group of people express their ideas and beliefs. France is an old country with a rich history and culture. As you begin your French language program, gaining a strong grasp on this history, the values, and the etiquette will help you rapidly achieve success. In particular, dining out in France is a complete experience for the French with very high expectations. Open for both lunch and dinner, but often closed on Sundays and Mondays, restaurants are second only to churches in their sacrosanct character. Because of the somewhat unpredictable nature of their operating hours and high potential to reach customer capacity, it is important to check their hours and to make reservations. You are expected to eat three courses, meaning an entrée (or horsd’œuvre), a plat principal (main course), anda dessert. It goes without saying that you are expected to order wine as well. If you are unsure what wine will go best with your meal, your waiter will be happy to make suggestions. Brasseries are restaurants that are open all day and serve a limited number of dishes that are always available, typically for a lower price than your average restaurant. Here it is acceptable to only order a main dish if you wish, but doing so without at least a glass of wine would still be frowned upon. In addition to restaurants and brasseries, keep an eye open for Relais Routiers. These establishements could be interpreted as anything from a truck stop, to a local watering hole that has a very relaxed atmosphere, and where it is not at all an issue to eat appetizers while drinking a beer. Bistrots are small local restaurants. The name is a loan word from Russian. Apparently Russian Cossacks on leave in Paris in the nineteenth century would rap on the table, shouting “bistro!”—meaning “quickly!” So bistrots became places that served quick, home-cooked meals. Steaks are a popular dish throughout France, and when ordering it is important to communicate how you would like it prepared. While “saignant” (rare), typically means rather bloody to those from North America, in France it is essentially a seared steak that is nearly raw in the middle, although brought to s safe temperature. If that sounds too raw for you, “à point” (pink) might be more to your liking, as it is somewhere between rare and medium rare in North American terms. “Bien cuit” (well done), is an available option, but will most likely get you a raised eyebrow and a shrug from your waiter if you decide to go that route. A last option is “bleu,” which means barely passed on the grill, and would be considered as raw by most Americans! Bon appétit mes amis! 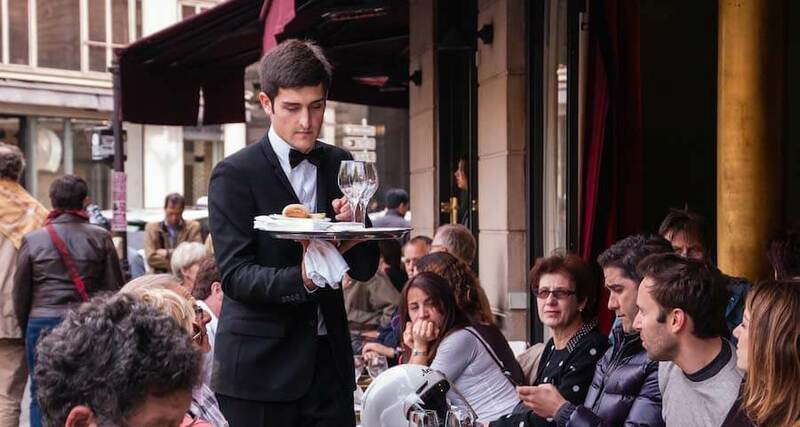 The dining experience in France comes with its own set of rules and visitors are expected to know them out of courtesy. For instance, the meal doesn’t begin until the host announces “Bon appétit!” to which the guests are expected to respond with the same phrase. The first sip of wine doesn’t come until the host offers a toast. He or she will raise their wine glass and announce, “A votre santé,” which is translated as “To your health!” Again, the guests are expected to respond in kind. The actual meal may present a bit of a challenge for the uninitiated. When faced with an array of silverware, the best policy is to start from the outside and work inwards. Typically, a large and small fork will be found on the left, and a large and smaller knife will be set on the opposite side. In some cases, you would be expected to hold onto a fork and knife for the next course, but where a fish course is followed by a meat course, the fork and knife will typically be removed. It’s best to mimic the actions of your host in these instances. The dessert spoon and coffee spoon will be in front of you, parallel to your position. They will likely be placed at the top, instead of at the sides with the rest of the silverware. Additionally, the spoons will be facing in opposite directions. There will be three glasses. The largest of the three will be reserved for water, which won’t be served until later in the meal. The smallest glass will be for white wine, and the third glass will be for red wine. You should only smoke after the meal. If you’re not sure, given the dining situation, it’s best to ask before lighting up. In public places, smoking has been forbidden for a few years. Throughout most of France, salad is served after the main dish and cheese is served later, just before dessert. Cheese should only be taken in a single serving, though you may take up to three kinds of cheese. When cutting your serving, make sure to preserve the triangular shape of the cheese. The French have very specific ideas on rude table manners. For instance, never use your knife to point at other guests during the conversation. Also, the only food in which it’s acceptable to use your fingers is bread. Pick up the bread and break apart your serving; never use a knife to cut a slice. Bread is eaten throughout the meal, so it’s perfectly acceptable to take another piece for yourself. Bread is not to be used to wipe your plate. Instead, be sure to eat everything on your plate with your silverware. The French view Americans as wasteful, so you don’t want to reinforce that misconception. Additionally, don’t let yourself get drunk. Follow your host’s actions, alternating water and wine. This helps to keep conversation flowing. You should wait to be served more wine, unless you’re invited to help yourself. French restaurants combine the atmospheres of the sacred with the celebratory. Full of both ritual and joy, dining out in French culture is something one must experience firsthand. With no shortage of restaurants to choose from, it is advisable to consult the Michelin Guide for dining direction. Using a system based on stars, this guide has been the gold standard for rating excellence in the restaurant industry since 1926. Michelin stars are still very highly prized, both in France and internationally. Coming in a somewhat distant second is the Gault-Millaut Restaurant and Hotel Guide, which is a very helpful resource for researching restaurants that have not been awarded a Michelin star. In recent years, trendier guides like Le Fooding have become more and more popular. Nothing builds rapport with French friends and colleagues like dining together. It is advisable to first invite them to lunch, allowing them to choose the menu and wine. They will do so sensitively, and will appreciate your discretion. Be familiar with dining protocol before you go, and dive headfirst into the experience. If you are simply passing through a town and are in search of a quality experience but have no guide to assist you, simply look for a bustling brasserie or restaurant. Word of mouth is exceptionally important in French restaurant culture, and rest assured that if a place is doing a lot of business, it is due to the high quality of their product and service.